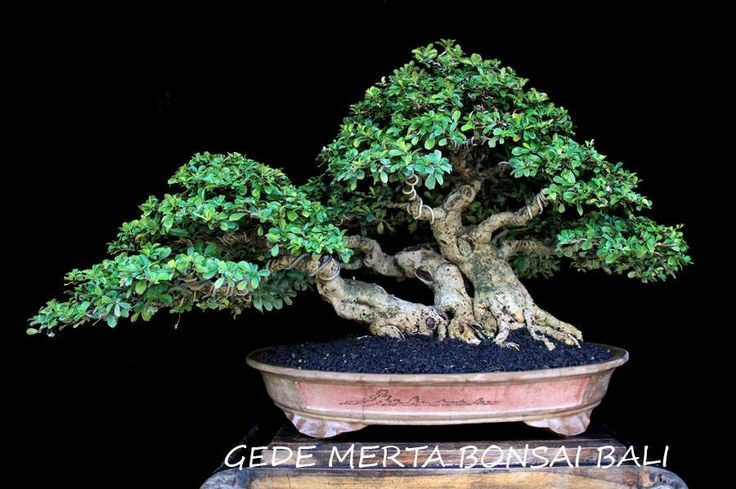 I first came across Gede Merta’s name in Peter Thali’s article, entitled Bonsai in Bali, in 2008’s “Bonsai Focus“, issue #133. 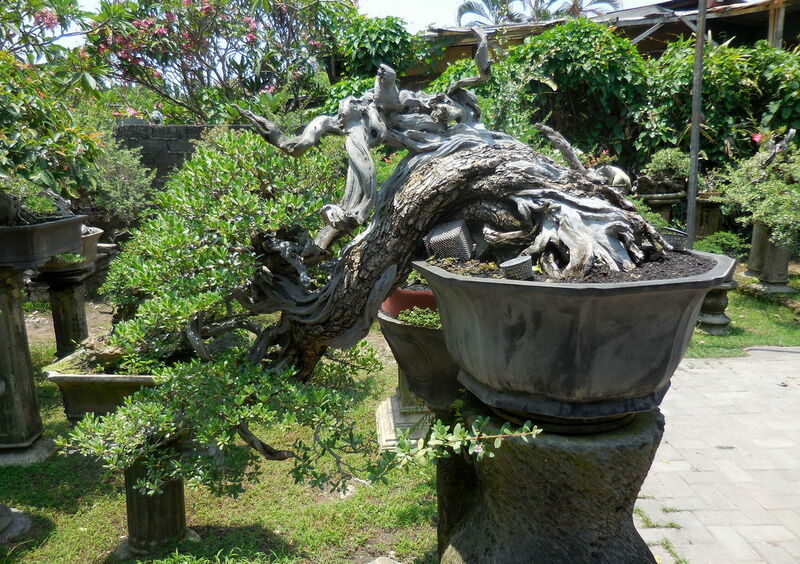 The article featured several very talented Bali bonsai artists and their beautiful trees. 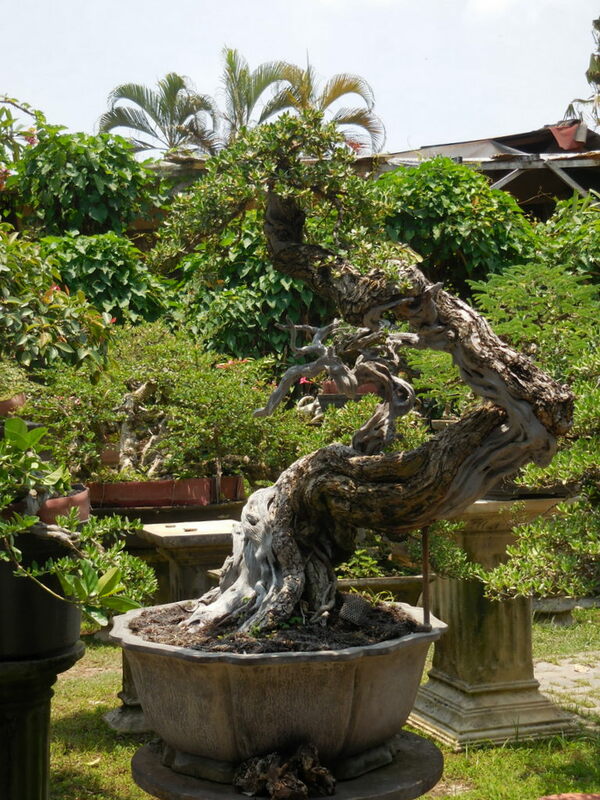 Another article followed in the 2009 issue #122, with Master Gede showing how to create a ficus with massive trunk and good nebari by fusing together young plants and seedlings. 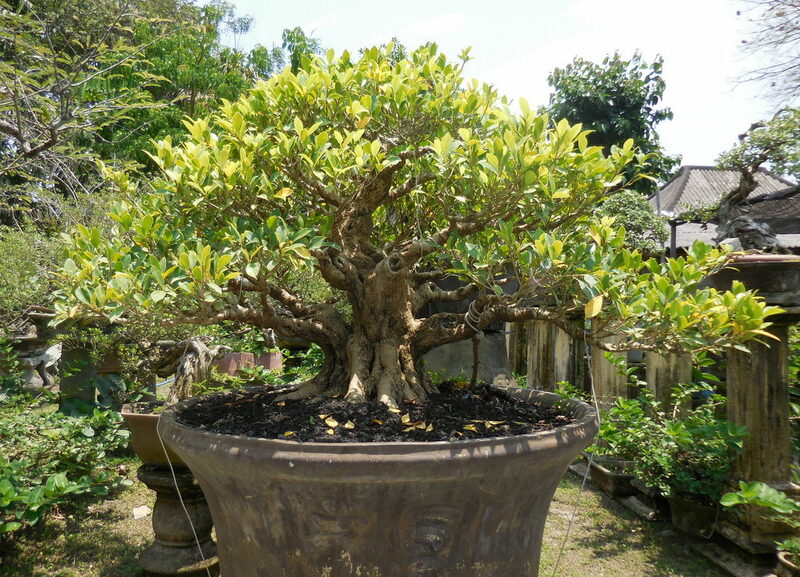 I was curious how this fused ficus looks now, and I had the good opportunity seeing the result when my wife and I were vacationing in Bali last month. 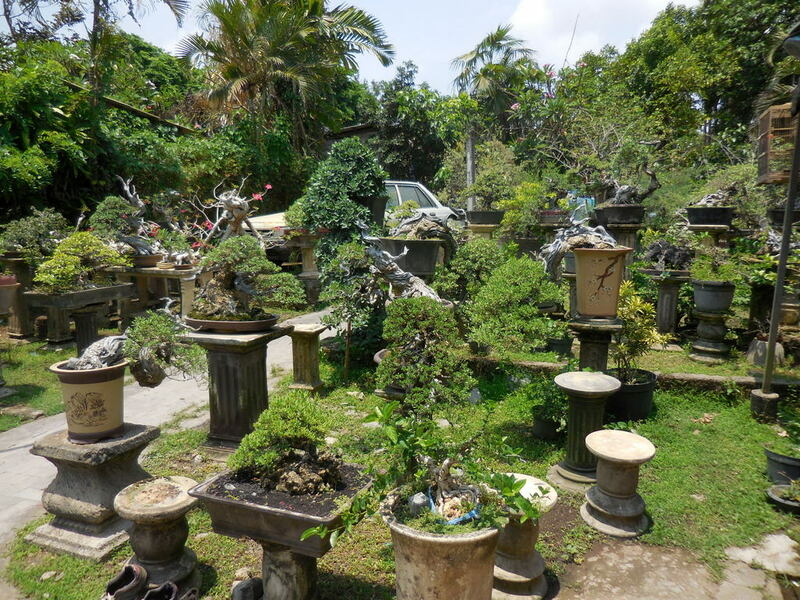 With the helps of Adhy Satya and Budi Sulistyo of the Indonesian Bonsai Society, we got in touch with Master Gede and he generously welcomed us to his nursery. 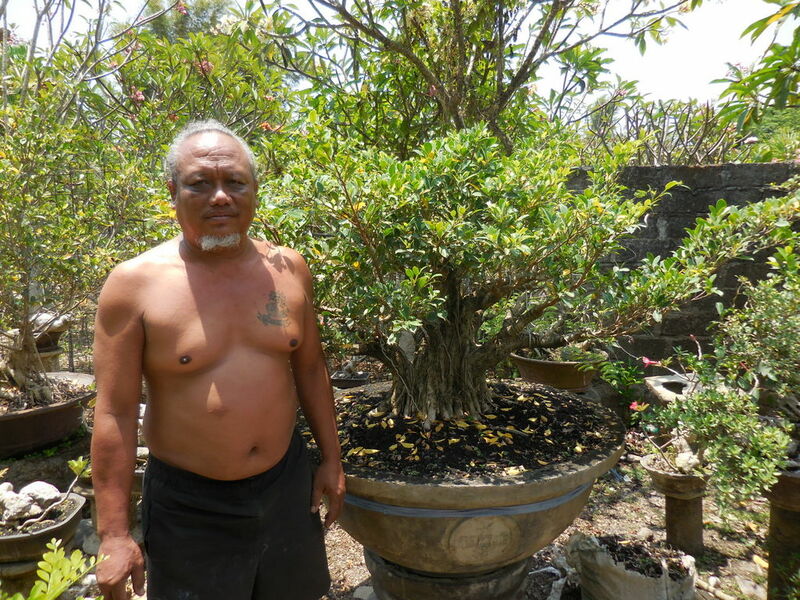 Master Gede Merta with his shohin Premna microphylla. In Indonesia, the honorific way of addressing a person of seniority is to use the word “Pak”, which literally means “Father or Uncle”. 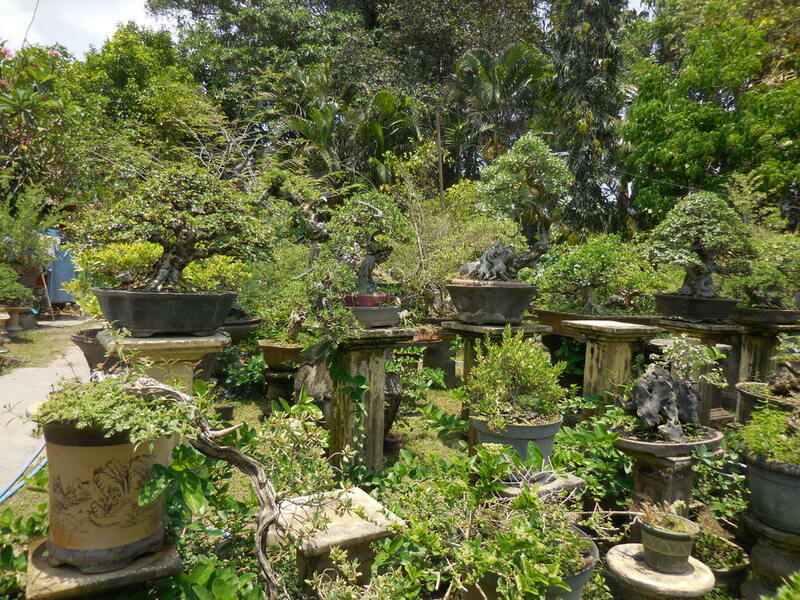 Everyone in Bali bonsai circle addresses Gede as Pak Gede. Pak Gede is a very unassuming person. He dressed casually, more often bare chested at home. He is very friendly and has a hearty laugh. 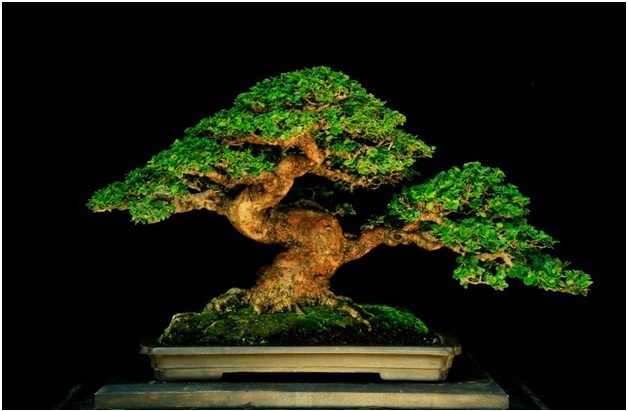 He sits cross-legged on the floor while working on bonsai. Lindsay Farr in his World of Bonsai video called him the Bonsai Buddha of Bali for the way he sits. 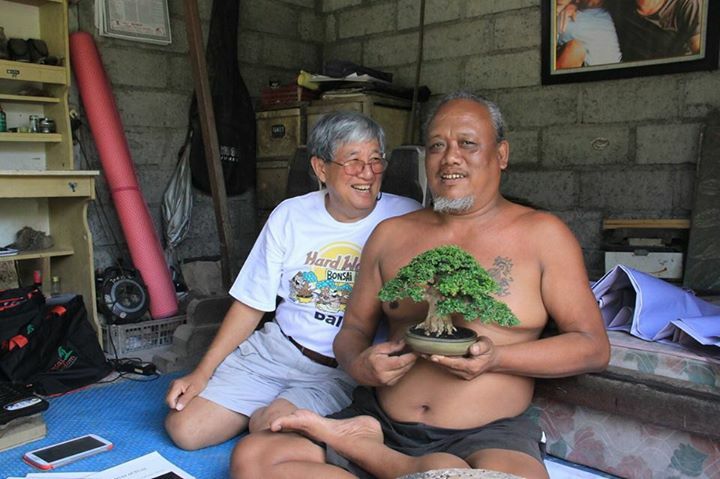 He used to be a co-owner of a restaurant in Bali beach resort area, called Bonsai Cafe, where customers can enjoy the food, beach and bonsai in the garden. 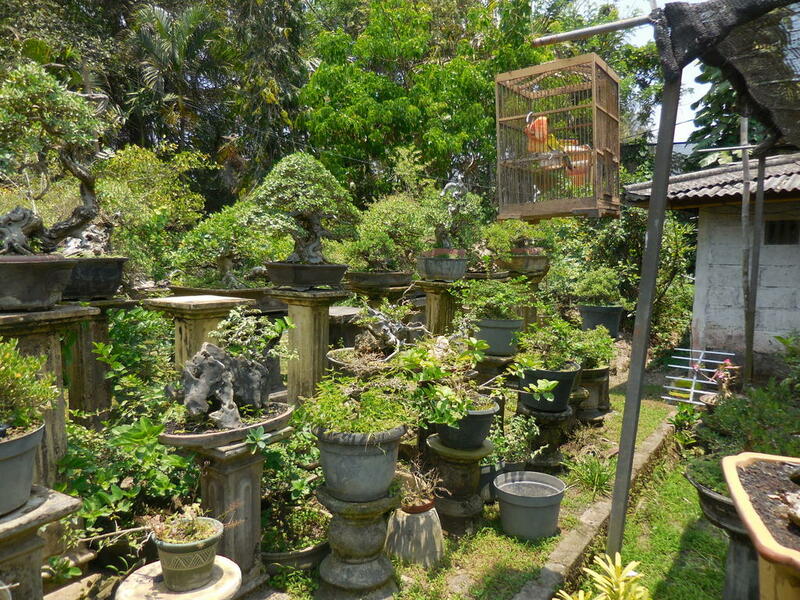 Unfortunately, Bonsai Cafe had closed and Pak Gede is currently running his nursery called “Paras Bali” in Denpasar. 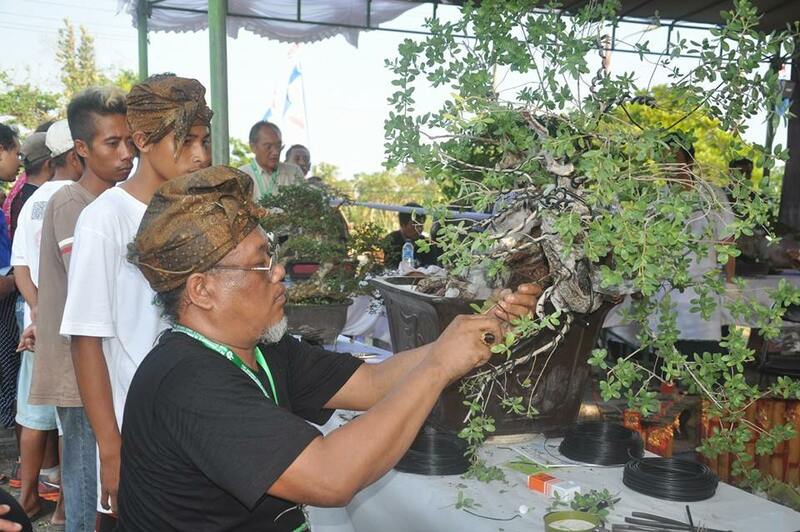 Demo at the Grand Indonesian Bonsai and Suiseki Exhibition in Bali. Although Pak Gede speaks very little English, we were able to communicate since we could speak passable Malay language, occasionally we needed translations by his younger brother, Dayan, on words we did not know as there are some differences in the Indonesian and Malaysian Bahasa languages. His wife, daughter, son and brothers were there when we arrived. 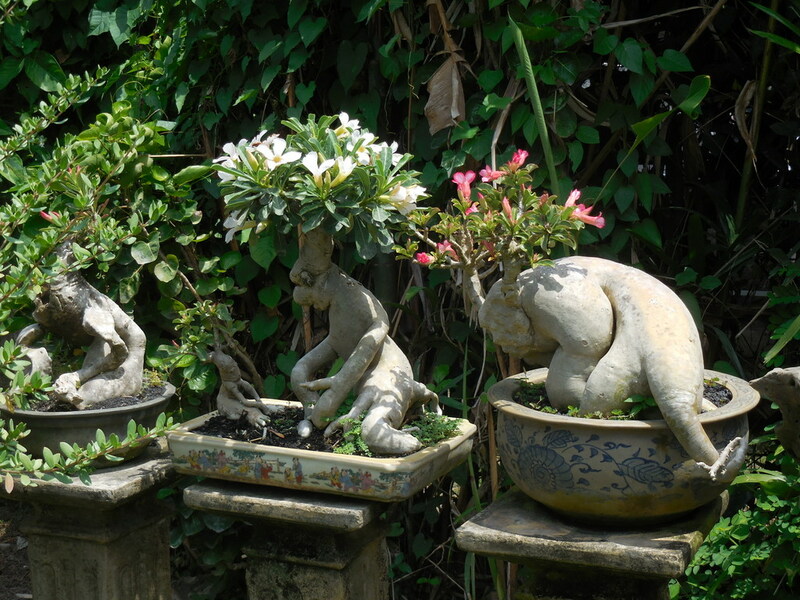 Pak Gede has been teaching them his bonsai knowledge, and they help out in the nursery. 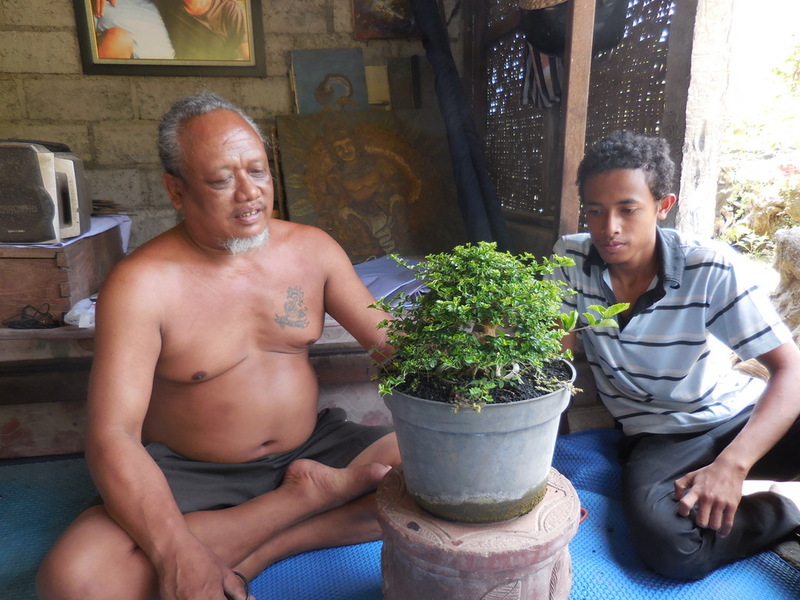 Pak Gede has high hope Dayan will succeed him and become a future outstanding Balinese bonsai artist. Pak Gede was very generous, he did a demo for us trimming an over-grown shohin Premna microphylla. This shohin was over-potted in a large plastic pot filled with crushed lava. 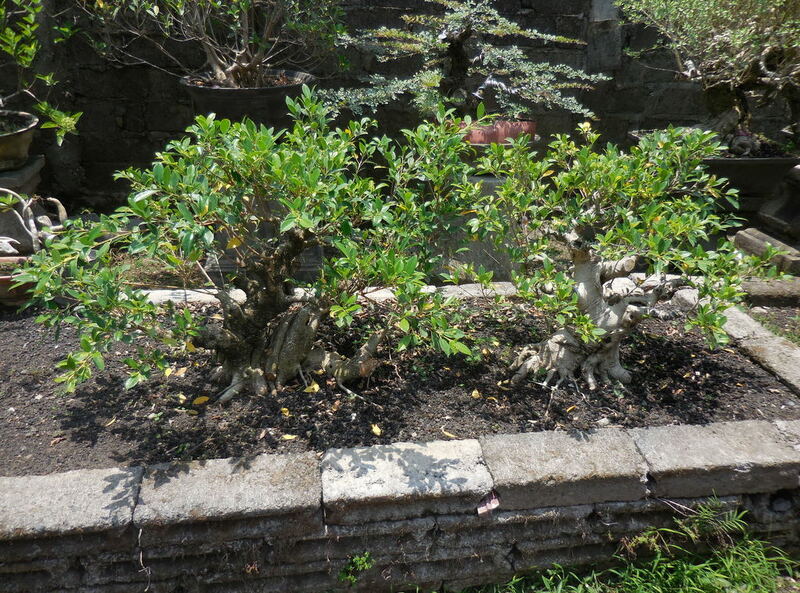 The purpose is to maintain enough moisture in Bali’s hot climate and to encourage a better root growth. This Premna was started as a cutting about 8 years ago. It is now a spectacular specimen tree ready for show. Ready to trim the overgrown Premna, with his yonger brother, Dayan at the side. 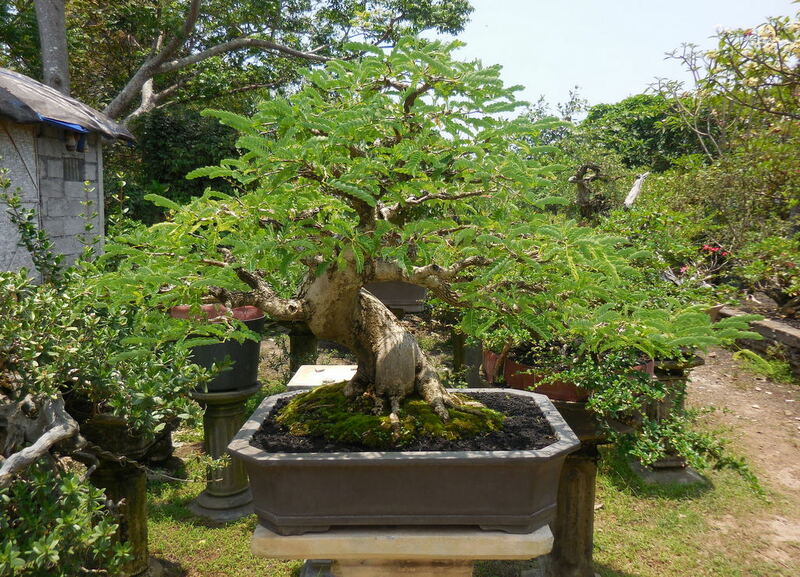 What happened to the fused Ficus microcarpa from the 2009 Bonsai Focus article? Here it is 5 years later! The attached seedlings had fused into a massive trunk and side branches, Some evidences of fusing could still be discerned but they would be undetectable in a few more years. 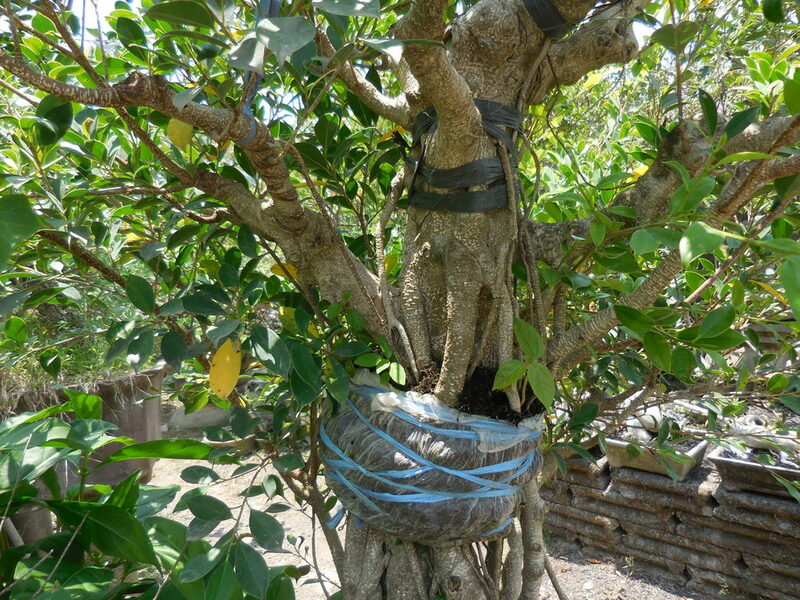 Air layering of a fused ficus into a multi-trunk bonsai. 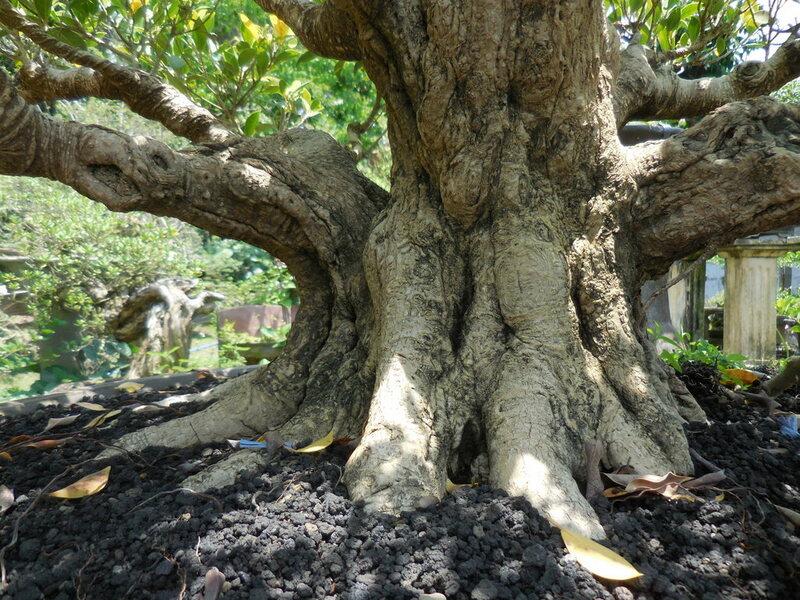 Ficus grown in the ground. Pak Gede said fusion gives faster result than growing in the ground. 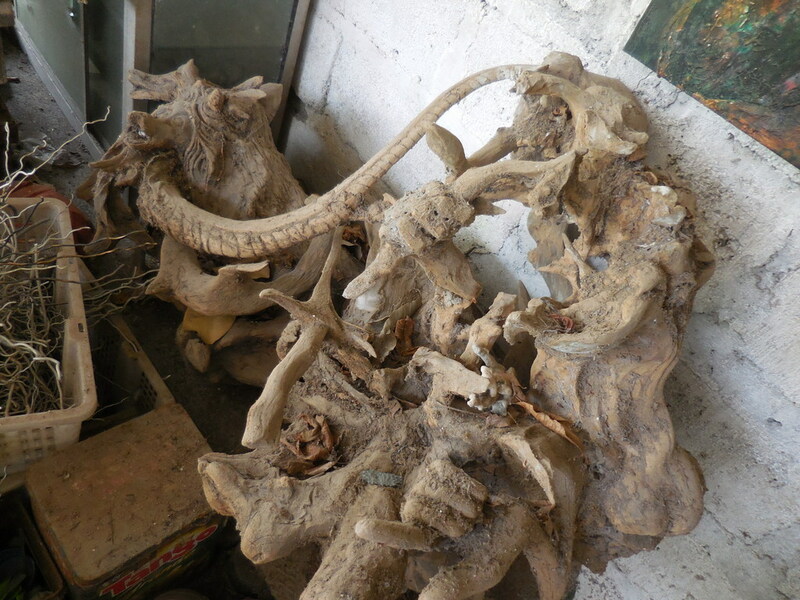 Pak Gede is also famous for his Pemphis acidula which were collected in the wild. His Pemphis has powerful trunk, marvelous carved dead woods and great movements. This used to be a very large tree. 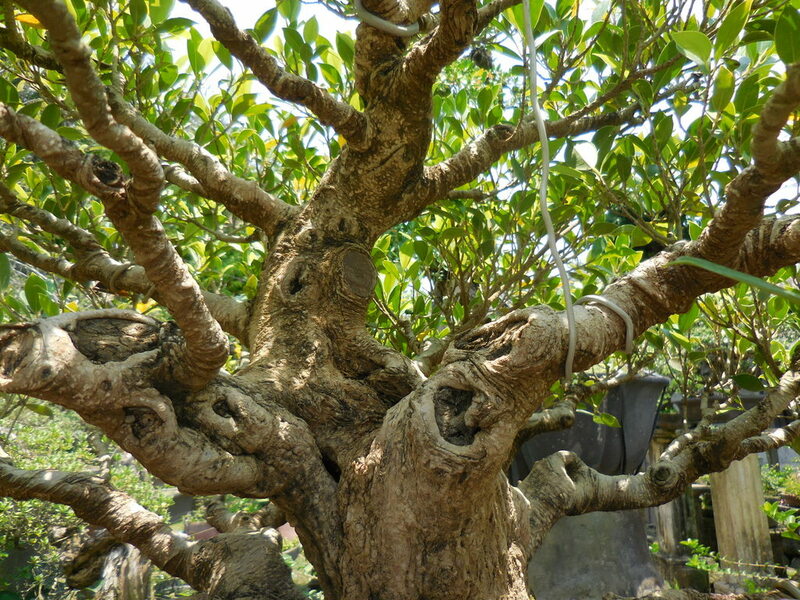 Pak Gede air-layered the main trunk and turned the side branch into the new leader, creating a bunjin tree. The new top will grow into a fuller crown. A future masterpiece in the making. This air layered part comes from the tree in the previous photo. 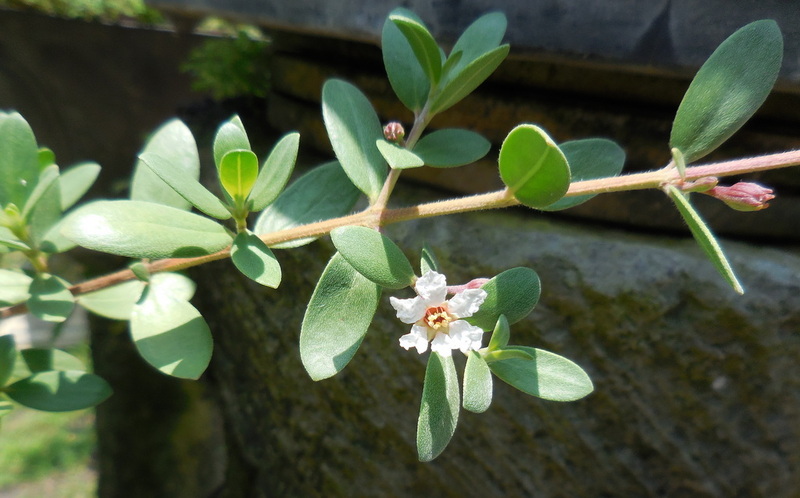 Pemphis acidula flowers and the tiny foliage. More trees in the nursery. They are all planted in 100% black lava and are in full sun. I am not kidding when I said Pak Gede is multi-talented. 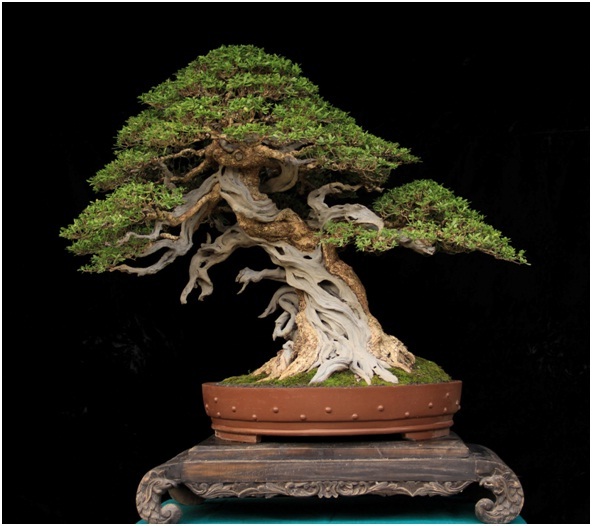 Besides bonsai, he does oil painting, wood sculpturing, and foot reflexology massage treatment. He has treated many patients, all gratis! He said that is the best use of this gift to benefit people. We saw some photos of grateful patients with him on the wall. 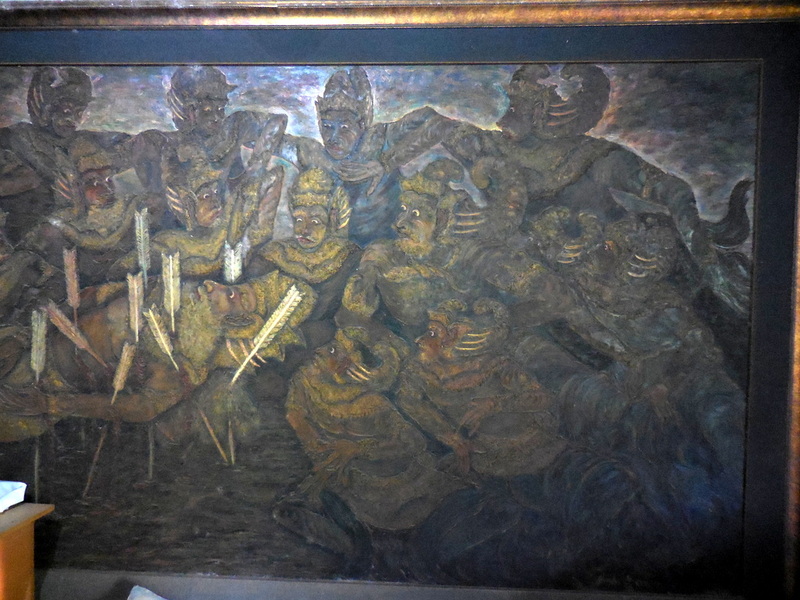 Oil painting of a scene from the Mahabarata epic story. Bishma with his sons after he was shot by Arjuna’s arrows. Giving my wife a foot reflexology treatment. His wife, son and daughter are in the background. 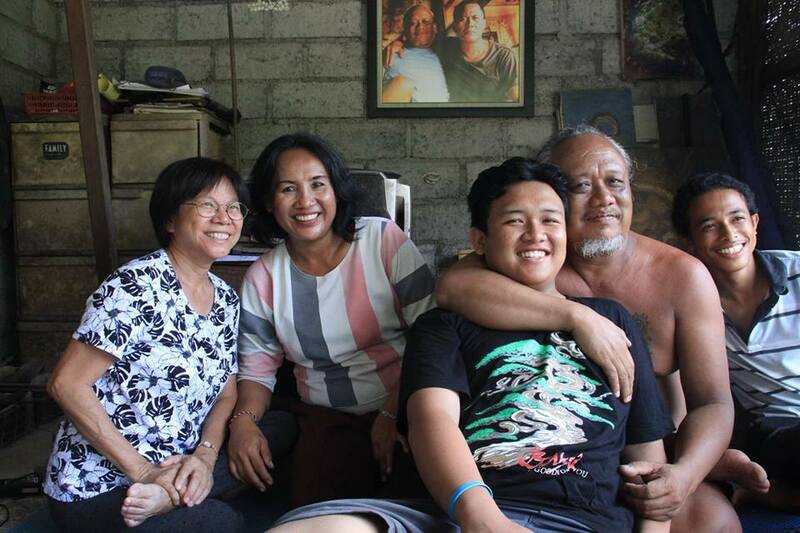 My wife and Pak Gede’s family. His 18 year old son also paints and had exhibited an abstract oil painting of the Bali bombing incident. 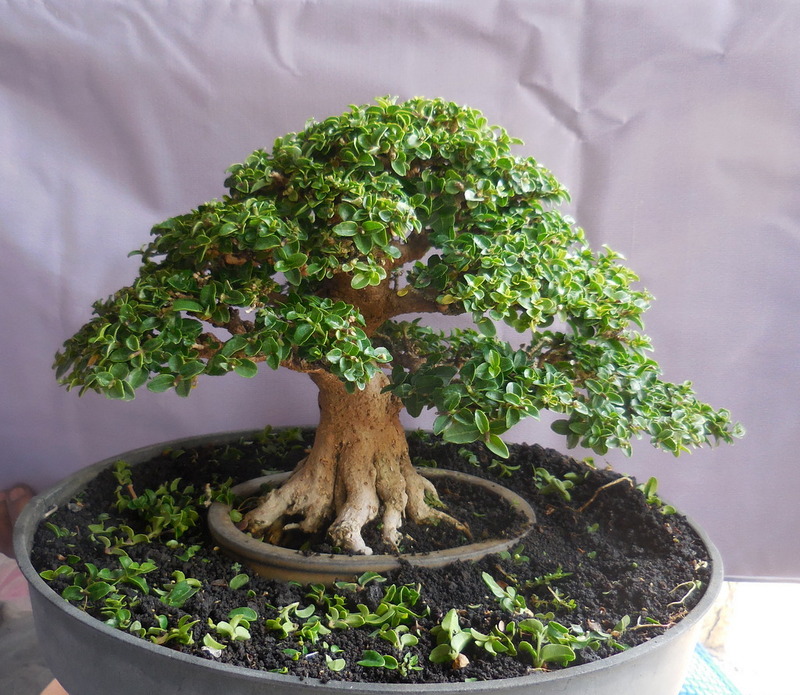 Premna microphylla, Bonsai Actual Award.